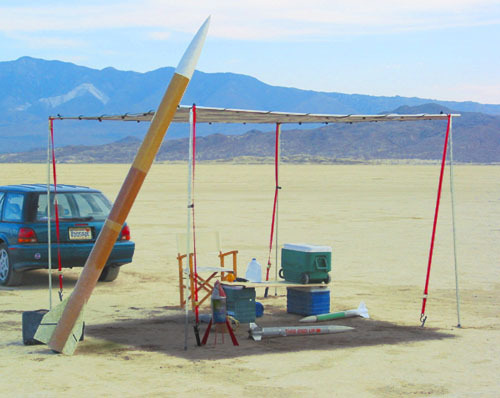 Shelter is a simple shade canopy to protect you, your rockets and your camp. Designed to be exactly what you need on the flightline. Sturdy construction and anchoring techniques to withstand the strongest winds. Shelter won't trap hot air, cast a glare or colored light, is easily and inexpensively repaired, and can quickly be joined to other Shelters. All anchoring hardware is included. All this for half the price of some less suited shade canopies. Currently Shelter is undergoing some redevelopment. Shelter will be made available at a later date, better than ever.